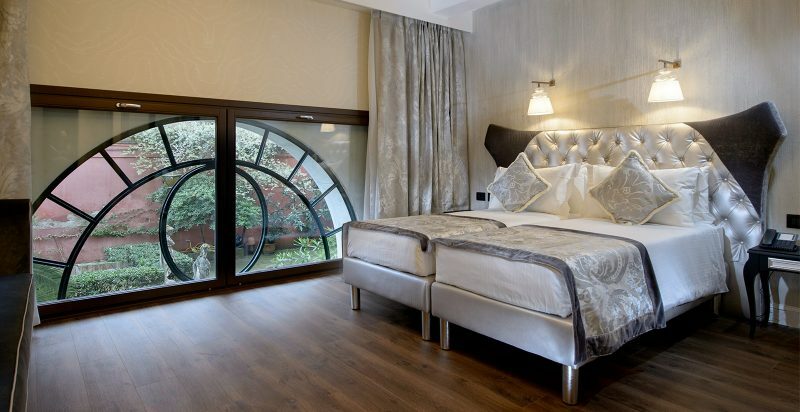 Spacious and luxurious, each Double Room offers a unique atmosphere that guarantees the most sophisticated comfort. Enjoy a quiet and relaxing atmosphere with views of the inner courtyard or to the lush garden. The double rooms also propose a charming view of the rooftops of Venice or to the small Ognissanti channel. Entering these cozy and sophisticated rooms and suites with private Jacuzzi you can immerse yourself in an environment that grants the maximum level of relaxation in the hotel. The Jacuzzi, located on the scenic private terraces or in the own room allows you to enjoy a romantic and exclusive stay. Welcoming and elegant, these rooms and suites, communicating or two-floor spaces are fully equipped and furnished to ensure a wonderful Venetian family getaway.